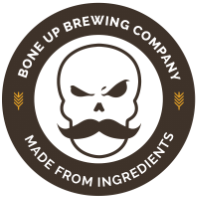 Stats: Doomrider - Bone Up Brewing Co.
Food Pairing: Grilled hanger steak. Or hard taco shells filled with skyline chili (add spaghetti to taste). Music Pairing (Jared's Choice): "Mars" by Gustav Holst. Best Occasion to Drink: Whilst sitting around a fire and talkin' sass. Brewers' Notes: We love us some farmhouse ales, and we love us some barrels every once and again, so we're chuffed as can be to have this big ol' barrelly farmhouse on tap! It's got a bit o' barrel punch (the barrels in question were previously used to hold Wheat Whiskey from Bear Creek) plus a touch of acidity to round things out and make this one dangerously easy to drink. We got whiffs of vanilla, oak, raspberry, and blackcurrant on the nose, with a hint of Belgian spiciness and a lovely crisp mouthfeel (despite its strength). Enjoy!